Today's OCC challenge is super easy. Ready for all the details? ?....make a birthday card. That's it! Make ANY kind of birthday card you'd like. Easy peasy, right? 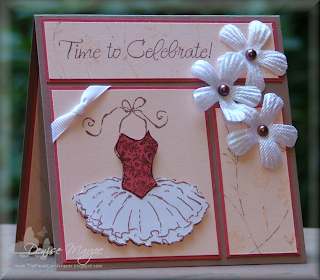 Hop on over to the OCC blog and check out the cool birthday samples from my fellow OCC girls. I got this cute WS image a while ago from Sandy, even had it colored and waiting in the file. ...the file...oh I should show you that sometime...my oh-so-professional (NOT!) way of storing PIF'd images, LOL! Anyway, sorry, I got sidetracked there. The image from "the file" was colored with Prisma Pencils and then blended with baby oil. Today I colored an extra balloon, blended it with Gamsol (because now that I've started working with Gamsol, I do prefer that to blending with baby oil), cut it out, and popped it up on dimensionals over the base layer. I added some red rhinestones over some of the pieces of confetti, glued them down with a small drop of Crystal Effects. 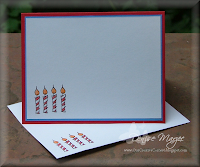 I stamped four candles from my Hero Arts Cupcake set in the lower left-hand corner on the inside of the card, colored them with Prisma Pencils, and blended them with Gamsol too. The card wasn't made with anyone in particular in mind. My 3-year-old will have lots of classmates turning 4 this year though, so I'm sure it'll be put to use in another couple months or so. Judy thought of a really fun challenge for today's LSC on SCS...make a card using something old, something new, something borrowed (with credit where credit is due), and something blue. Something Borrowed: I l-o-v-e the way Jami (sgtstamper) twisted the cord and ran it along two sides of her card seen HERE. Have you seen Jami's gallery?? She's incredibly inspiring! I was at the dentist yesterday for my 6-month cleaning and saw an ad in a magazine of a bedroom decorated in blue and orange, so that's where I got the idea for the color combo. 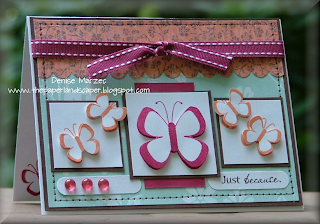 I already had the butterflies colored and cut out from a card I made last month. There are two of them on this card, layered on top of one another with dimensionals. They were stamped in Versafine Black Onyx onto Fabriano Watercolor Paper, watercolored with reinkers/ink pads, and then I added some Stickles on the lines on the butterflies. The flower was stamped in Versafine Black Onyx onto white Georgia Pacific CS, colored with reinkers, cut out with an oval Nestabilities die, and then Stickles were added. The scallop ovals are also Nestabilities. The white oval and the Ballet Blue oval are each up on separate layers of dimensionals. I ran two 4" x 5.25" panels through my Leafy Branch Cuttlebug Folder, one Ballet Blue and one White, cut the White one from corner-to-corner, and then glued it over the Ballet Blue panel. Inside of the card: Ballet Blue mat, White mat, and then some of the leftover white Cuttlebug pattern was added to the lower left corner. Real quick before I sign off for today, I wanted to let you know about a special Customer Points Program that Jessica from There She Goes is offering. You can check out all the cool details HERE! Hope you have an awesome Friday. 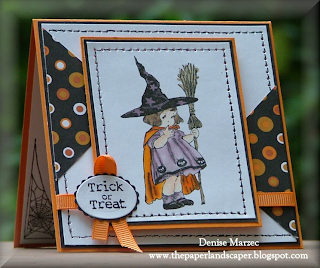 Be sure to check back tomorrow for another fun OCC challenge. Hi everyone! Okay, here we go....combining challenges here. 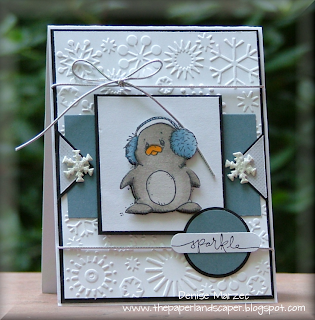 Sunday's Featured Stamper was Patricia (kokirose)! Love her gallery! There were several cards that I already had in my favorites, but HERE is her card that I CASE'd. Love her stamp choice, the pearls, scallops, swiss dots folder, and dimension on the flower so I kept all that. I changed the colors to the ones in today's color challenge #CC181 on SCS, which was to use Rose Red, Basic Black and Kraft. I moved the pearls and sentiment around, left off the script background (only because I don't have it), and left off the ribbon. I used my Martha Stewart border punch too. The flower was stamped three times, and all three blooms were layered on top of one another with dimensionals. The leaves were stamped twice and layered with dimensionals. The inside of the card has the bee from the Bloomin' Beautiful set stamped in the lower left corner. Hope you're all having a really great day! 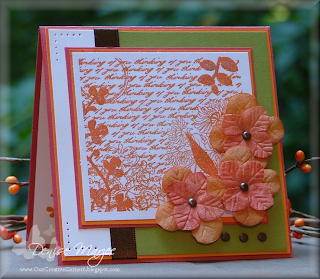 Today, Dawn is challenging everyone to make a card using Ruby Red, Pumpkin Pie, Old Olive, and optional Chocolate Chip. Fun fall colors! Be sure to check out the challenge on the Our Creative Corner blog....and play along with us. We love when you do! My card is 4.75" x 4.75" square. I followed one of Julee's Anni-VERVE-sary sketches. 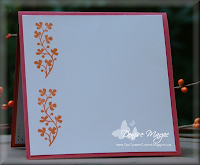 The Fresh Cuts image was stamped in Pumpkin Pie and then I added some Martha Stewart orange glitter pen to the stems. Did you know that WalMart now carries Martha Stewart products?? I picked up the orange flowers at Joanne's last week. The middle flower (the one in the corner) is up on two layers of 3-D glue dots. I'm attaching a picture of the inside of the card too. Hope you're all enjoying your weekend so far! Hi everyone! Remember my post a couple days ago about Jessica Knutsen's new stamps? ?...well, she asked me to join her design team!! I won't be starting until November because of some other commitments (...and no I'm not telling what they are, LOL!...you'll find out soon though.) but I'm super excited to be working with her and the rest of the team she's pulled together. I won't have anything crafty to show you today...DH and I are headed to Philly this afternoon. We're going to grab an early dinner somewhere and then to see Kid Rock and Lynard Skynard!! Be sure to check back tomorrow though for the Our Creative Corner Challenge. Dawn has another fun challenge in store for us! Don't ya just wanna hug him?!! 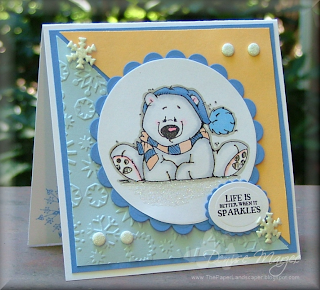 This is Bundled Up Mike, he's one of my newest stamps from Whipper Snapper. My order just came yesterday. Yay! I followed today's SCS Sketch Challenge #SC190 for the layout, and went with today's colors from the girls on the Color Throwdown blog (Ballet Blue, Bashful Blue and Apricot Appeal). As soon as I saw Ballet Blue and Apricot Appeal were two of the colors, I said, "I'm there!" These are two of my most favorite SU colors. Mike was colored with Copic markers (number are noted below in the recipe), then I added some two way glue on the ground and heat embossed it with Irridescent Ice embossing powder. The round brads are white sugar-coated/sparkly brads. The white snowflake brads were heat embossed with the two-way glue and Irridescent Ice EP as well. The Bashful Blue scallop circle is up on dimensionals and so is the scalloped oval behind the sentiment. The inside of the card has a snowflake stamped in the lower left corner in Ballet Blue. So how am I doing with the copics?? If you see something I could do differently to improve, *please* let me know. Today's color combo and other cool schtuff! 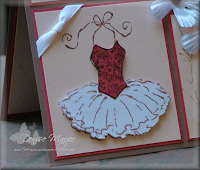 I stamped the party dress in Close to Cocoa classic ink onto Blush Blossom CS, White CS, and Ruby Red CS. I cut out the Ruby bodice and the White skirt, and then popped them both up on dimensionals over the one on the Blush Blossom panel. I inked up my Pretty Petals background stamp with Blush Blossom Classic Ink and then "thumped" a Close to Cocoa marker all over the rubber before stamping onto the CS. I added some clear Sakura sparkle pen to the white skirt. I stamped some more Pretty Petals on the inside of the card, again with the "thumping" (love that word) technique, vertically along the left and right sides. Thanks for stopping by, and I hope you enjoy your day! 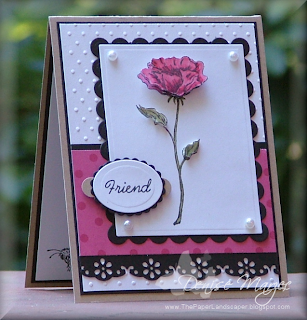 I'm so excited to see that Jessie (knightrone) has been picked for today's featured stamper challenge. You can see her gallery HERE and her blog HERE. CONGRATULATIONS, Jessie! 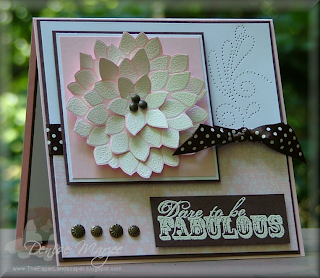 I think you're pretty fabulous so I picked one of your cards using the Fabulous Flowers set. I picked this one HERE to CASE. I kept your same layout (just moved the sentiment to the right), used the same stamp set and embossed the three layers of flowers, and kept the same number of layers. I just changed the colors, DP, and used antique brass hardware instead of silver. I hope you have an awesome day today crusing the galleries and blogs. Have a blast!! I stamped the flower three times in Colorbox white and then heat embossed with white embossing powder. I cut out the flowers in different sizes like Jessie did, put them all together with the brass brads, and then popped the largest flower up on dimensionals. The Chocolate Chip square mat behind the flowers is up on dimensionals as well. 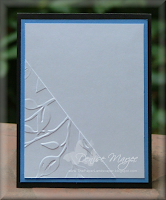 The sentiment was stamped in Versamark, heat embossed with white embossing powder, and popped up on dimensionals too. The piercing up in the right corner was done with an Ornare piercing template. My friend Lori (LMcAree) bought it for me as a gift when we went to OC in May. You can buy them at Ellen Hutson's store. Cool little tool! The hardware in the center of the flowers are the brads from SU's Hodgepodge Hardware set. The hardware next to the sentiment is from Michael's, in the jewelry aisle. They're glued down to the paper with a very small dot of crystal effects. Hi everyone! For today's challenge on Our Creative Corner, Dawn has another sketch for everyone...and you can check out the sketch by clicking HERE. Wanna do some blog hopping and see the samples from my fellow OCC girls? Here are links to all their blogs: Amy, Cindy, Dawn, Jennifer, Laurie, and Lynda. Don't forget to also check out Julee Tillman's blog. She's our special guest designer this month! Just playing with more Whipper Snapper images that I got from the PIF thread (thanks Leslie!!) and the K & Company DP from Michael's. This image is called Friendly Scarecrow. Someone PM'd me yesterday asking about the PIF (that stands for "pay it forward") thread and how to find the current one. I'm sorry, I should have mentioned the current round for those wanting to look into it, and I'll try to do that from now on when I post images I've received there. :) The PIF threads can be found on SCS under Swaps and then under Everything Else. You'll see several rounds listed. As of right now, they are on Round #51 and you can see that thread by clicking HERE. Another way to tell which round is active is to go into the Swaps/Everything Else Forum and look at which one is at the top of the thread. Because it's so active with chatting, it's usually at the top. You can also then click on "Last Page", go to the last reply, and as long as you don't see a note stating that the round is closed, you're good to go! It's a great way to try out images before buying them! The girls are really nice in there too and will help you with the "rules". Pssstt...they LOVE newbies! Oh, and I saw a message from Gigi under my Crafty Secrets post the other day asking if I knew about any cute Halloween images for ornery boys. Gigi, personally I think THIS ONE and THIS ONE are pretty cute! :) Hope that helps?? 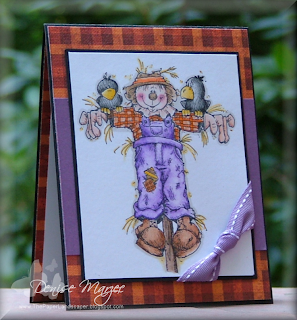 Okay, so onto my card.....have I dressed my scarecrow funny with the purple pants? hehe! He was colored with prisma pencils and gamsol, and then I added the halo effect with a Warm Gray Copic marker (W-1). If you have any other questions, don't hesitate to ask. :) I just got the new SU catty yesterday (thanks to my awesome friend, Silke!) so I'm off to place my order! 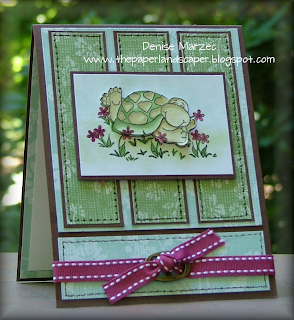 Don't you just love Whipper Snapper Designs? 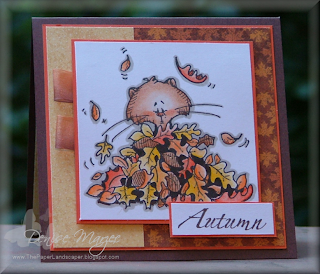 This one is called Fall Fun Kitty, and I got the image on the PIF Forum on SCS. The PIF forum can be found under the Swaps Forum and then under Everything Else. I colored most of the image using prisma pencils and Gamsol, then I added the halo using a #W-3 Warm Gray Copic marker and filled in the shadows behind the leaves with a #E49 Dark Bark Copic marker. I added a little clear Sakura sparkle pen to the leaves too. The card started out as one of Julee Tillman's Anni-Verve-sary Sketches (Sketch #9)....but with the size of the kitty image and not having room for the three circle elements, it went a whole different direction....and actually looks more like one of the sketches I used for this month's Fan Club gallery on SCS...which will be opened this Friday by the way. :) The Tangerine panel behind the kitty is up on dimensionals. The inside of the card includes a 4.75" x 4.75" Tangerine Tango panel with a thin strip of the Fall Harvest DP (the yellow print) vertically along the left side. I've been dealing with a killer migraine and nausea for almost two days....finally feel better today so I got to do some stamping again, YAY! 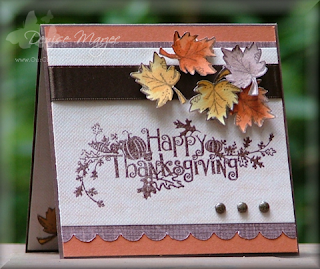 Have you seen today's Featured Stamper on SCS? It's Kim (Blondie090277) and, WOW, she has an awesome gallery! Congratulations on being today's FS, Kim! There were several cards that I wanted to CASE, but I chose her Accessories Card. I kept the same basic layout, I just angled the sentiment panel and ribbon. I also kept the same fashion theme with the purse and shoe at the bottom, I just used my new Diva-Lish stamps from Unity. Kim used Stickles on her shoe and purse, I used some Pink Smoothie glitter from Art Institute Glitter...very sparkly! 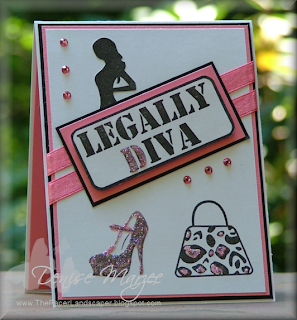 I also changed out the brads for some pink Swarovski crystals and added the silhouette (my favorite stamp from the Diva-Lish set) behind the Legally Diva sentiment. The Legally Diva panel is up on a layer of dimensionals. 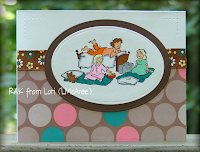 I glued down a piece of Regal Rose CS to the inside of the card and stamped another purse in the lower right corner. 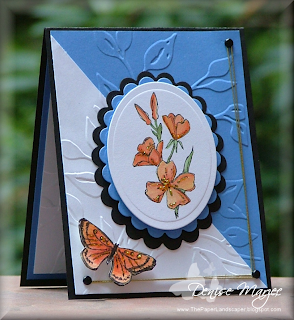 Dawn Easton is our hostess with the mostess this month for the Our Creative Corner Challenges, and this week she's challenging everyone to make a card with a maximum of four layers and no DP. You're all welcome to play along in the challenge. 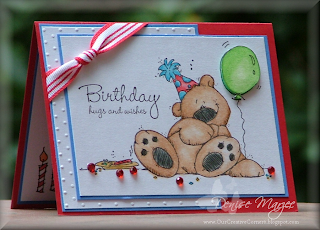 Just make a card and post a comment on the OCC blog with a link to your project. If you're uploading to SCS, please remember to use keywords OCCC. My card base is 4.25" x 5.5". The main image is colored with Copic markers (numbers are noted below). I added orange Stickles to the pumpkins, and platinum Stickles to the leaf. The white main image panel is up on a layer of dimensionals and the orange scallop rectangle is up on a separate layer. I love dimensionals...especially when I have to limit layers. It makes it puffy and gives it the feel of being a thicker card. 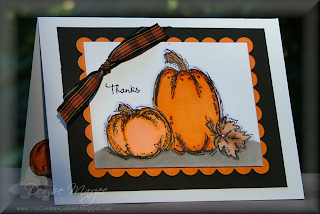 I added another small pumpkin on the inside of the card, stamped in the lower left corner. Isn't this little girl from the new Crafty Secrets set CUUUTE?!! I love her! My youngest daughter was a cute little witch last year for Halloween, so when I saw this little girl, I ordered the set right away. I followed Sketch Challenge #SC188 on SCS for the layout. Yesterday's Crafty Secrets Challenge was to use your initials when picking items for your card/project. My initials are DRM. I used Designer Paper for the D, Ribbon for the R, and Markers for the M.
The orange mat panel behind the main image is up on 3-D Glue Dots. The inside of the card has a white panel with cob webs (also from the new Crafty Secrets set) stamped in Versafine Black in the lower left and upper right corners. I watercolored her skin with Blush Blossom Classic Ink. I have two cards to show you today. The first is for the Verve Anniversary Celebration, sketch #4. My friend Lori (LMcAree) sent me these super cute Whipper Snapper Ike images. Love him and just had to make a card with some of the images. Thanks, Lori!! Ready for this?? He's colored with Copic markers! !....this is something I've been struggling with because I couldn't get the "shading" thing down and didn't really understand how to blend two colors. Well, I saw an awesome explanation on Emily's blog that you can see HERE. Check it out, it totally helped me! She also told me to keep going over that darker "line" with the lighter marker, over and over in little circles....really saturate it. Eventually that line blends away. It works!! Emily, I can't thank you enough for your help....I FINALLY like my Copics!! Anyway, if you're struggling with Copics like me, check out Emily's blog! I colored two penguin images, cut one out, and popped it up on dimensionals over the first one. The black mat behind the penguin panel is also up on a layer of dimensionals. For the triangles on the sides, I cut out a black square and a square from PTI's linen vellum, then cut the squares in half on a diagonal. I added some Pearl Ultrafine Pearlescent glitter from Art Institute Glitter to the snowflake brads. I also stamped a snowflake in the lower left corner on the inside of the card and then heat embossed it with Irridescent Ice embossing powder. The next is for sketch #3 in the Verve Anniversary Celebration AND today's Color Challenge on SCS...a farewell to the '08 In Colors. I'm going to miss these colors!! The butterflies were stamped in Purely Pomegranate and Groovy Guava on the base panels, then I stamped some more in the same two colors, cut them out, and popped them up on dimensionals over the ones on the base. The scallops were done with the new scallop edge punch by SU. Using my mat pack guide, piercing tool and a Chocolate Chip marker, I faux stitched around the outside of the card. The dew drops are glued down with a small drop of Crystal Effects. There are two Pomegranate butterflies stamped on the inside of the card, one in the lower left and one in the lower right. 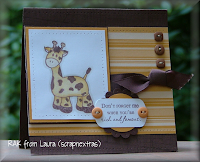 Look at this sweeeeeeet card I received from Laura (scrapnextras). Such great details! Love that she used the Sanded BG on the base and there's some Sakura sparkle pen on the giraffe's spots. 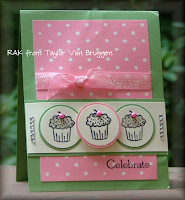 Here's a card I made for Taylor's Cupcake Friday challenge. The card measures 4.25" x 4.25" square. 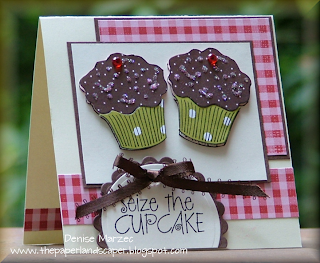 I stamped two cupcakes on PTI's Chocolate DP (the vanilla paper with small chocolate polka dots), cut those out, and glued them down on the vanilla panel. I stamped four more cupcakes on the new Bella Rosa DP from SU (two on the Kiwi Kiss print and two on the chocolate polka dot print), cut those out, and popped them up on dimensionals over the base cupcakes. I added some Pink Smoothie Glitter from Art Institute Glitter (awesome stuff...reeeeally sparkly) and then glued down two red rhinestones for the cherries. I also got this pink and green cutie from Michelle (shaddybaby)! Today we're celebrating my grandmom's 90th birthday at my aunt and uncle's pool. The sun has just started go come out, so it looks like it'll be a good day for swimming. Be sure to check out the Our Creative Corner blog to see all the samples from my fellow OCC girls as well as this week's special guest designer, Julee Tillman. Everyone is welcome to play along in the challenge. To participate, post your project to your blog or gallery and then leave a link in the comments section on the OCC blog. If you upload to SCS, use keyword: OCCC. Remember, there is no time limit. Feel free to participate whenever you're able. My card is a long card. I took a 7.5" x 7.5" piece of Groovy Guava CS and folded it in half...it'll fit in a standard #10 envelope. The curve in the green floral print from the Afternoon Tea DP was done freehand. I also freehand pierced the holes, and then faux stitched with a Chocolate Chip SU marker. Helloooooo everybody!! Sorry I've been MIA...we've been at the pool a lot this week. Get this, remember I said my 3-year-old was learning how to do cannonballs earlier in the week? Well, on Wednesday, she wanted to jump off the diving board into the deep end. I thought for sure she'd get up there and chicken out...nope, 45 minutes of non-stop jumping in the pool! It was awesome! !...totally wore her out too (that's a GOOOOD thing!). Don't worry...I was right there next to the board reminding her to jump out from the board and making sure her arm floaties were good and tight each time. What a fish, LOL!! Okay, so today I wanted to do the Limited Supplies Challenge on SCS, which was to make a "happy card"....just something that would make someone smile. I thought this smiling turtle would be a good stamp for today's card. He makes me smile! I followed Wednesday's Sketch Challenge for the layout. Love this sketch! I pierced holes around all the panels with my piercing tool and mat pack template, and then faux stitched with a Chocolate Chip SU marker. The turtle was stamped twice in Versafine Black Onyx, both images were watercolored with reinkers, and then I cut out the second turtle and popped it up on dimensionals over the first one. My mom asked for a bunch of sentiment-free note cards...so this is another one for her. I lightly (and I mean really lightly...it may not show up in the pic) sponged some grass and a blue sky around the turtle. ...and I just HAVE to share this card with you. My friend Lori (LMcAree) sent me this little cutie. Back in May, Lori, Janice (catcrazy), and I went to a stamp show in Ocean City, Maryland. Wanna know what Lori wrote on the inside of the card? She said that when she saw this image, she had to get it because it reminded her of our great time in OC. She's right, that's us sitting in our hotel room gabbing! hehe! Thanks, Lori! You made me smile! That's it for today! Hope your Friday is a good one!